When Aerosmith bassist Tom Hamilton calls from Newport Beach during an afternoon stop on the band’s whirlwind Get a Grip tour, I presume he’ll be playing somewhere in California that night. Wrong-o, Steve-o. He’s doing a gig in Vegas instead. You can do that when you’ve got your own private jet. “We’re doin’ the plane thing,” says Hamilton, referring to Aeroforce One, on which the band has already logged more than 150,000 miles during its latest tour. Zipping off to places like Vegas is common for Aerosmith nowadays, even if its members rarely have time to try their luck on the one-armed bandits. Losing money isn’t something that Aerosmith is good at. Propelled by the Top 40 success of such hits as “Cryin’ ” and the Grammy-winning “Livin’ on the Edge”, its latest release has now vaulted over the 10-million mark in worldwide sales. But besides selling mountains of CDs and tapes, the band has made lucrative inroads in other areas of the entertainment world. It made history last June as the first major rock band to offer Compuserve subscribers a free download of an unreleased song, an outtake from the Get a Grip sessions. It launched an interactive arcade video game, Revolution X, which sees the band members save the world’s youth from a society without music. And next year there’s a biography, tentatively titled Walk This Way: The Aerosmith Saga, scheduled for hardcover publication, to be followed by a paperback edition in ’96. 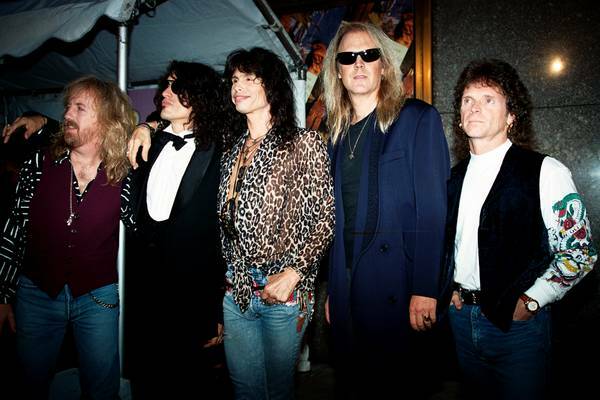 The book will be authored by Aerosmith with Stephen Davis, who penned the best-selling Zeppelin tome Hammer of the Gods. Things could not be going better for Boston’s bad boys of rock, and much of the band’s recent good fortune is due to Vancouver, where Aerosmith recorded its last three albums. Hamilton calls our town “the sexiest city in the Northwest”. As well as Get a Grip, Aerosmith—with producer Bruce Fairbairn at the controls—recorded its top-selling Permanent Vacation and Pump albums down at Little Mountain Sound’s old West 7th Avenue studios. Considering the enormous success Aerosmith has had with the Lotusland connection, you’d doubt the band would ever want to fiddle with that partnership. But nothing is cut and dried in the ’smith household. Whether Aerosmith continues to use local talent and facilities for its recordings or not, it isn’t likely the group will fizzle away into obscurity anytime soon. 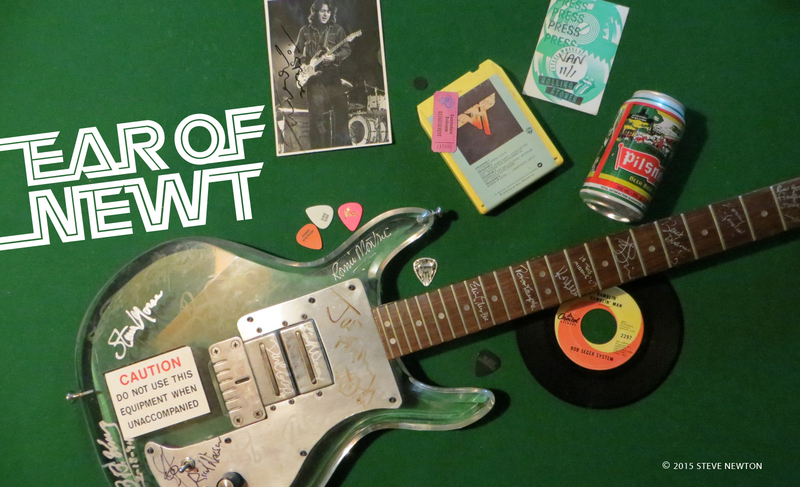 It’s been around since 1971, when former Jam Band members Hamilton and lead guitarist Joe Perry joined forces with vocalist Steven Tyler, drummer Joey Kramer, and rhythm guitarist Brad Whitford in Sunapee, New Hampshire. Shortly thereafter, the band moved to Boston, started mixing heavy rock with R&B, picked up a local following with impromptu outdoor gigs, got signed to Columbia Records, and the rest is legend. Hamilton hardly visualized his band closing in on a quarter-century together. Aerosmith’s long history includes its fair share of down times, such as when various internal problems led Perry to leave the group in ’79. That was after the band had already achieved widespread popularity with the breakthrough Toys in the Attic and the drug-addled but nonetheless masterful Rocks. At the time, Hamilton wasn’t worried that Perry, a main creative force in the band, might never return to the fold. Much has been made of Tyler and Perry’s previous life-threatening drug habits, but the band’s most visible members—its so-called Toxic Twins—were not the only ones indulging during the overindulgent ’70s. Conversing on the pros and cons of drug experimentation leads to talk of that biggest of drug bashes, Woodstock—in particular, its 25th anniversary version, which Aerosmith helped draw huge crowds to last August. Aerosmith’s next big concert event—at least as far as local fans are concerned—happens this Monday (October 24) at the Pacific Coliseum. Opening that show is Pride & Glory, a southern-rock power trio featuring Ozzy Osbourne guitarist Zakk Wylde. Over the years, Aerosmith has shared the stage with some of the world’s top bands, but there’s one particular opening act that stands out in Hamilton’s mind: AC/DC.